(NaturalNews) Gastritis, a condition in which the stomach lining becomes inflamed, can be caused by a number of factors. Too much alcohol consumption, viral and bacterial infections, taking aspirin or ibuprofen, having an autoimmune disorder and even stress are common culprits behind this digestive problem. That's the bad news. The good news? 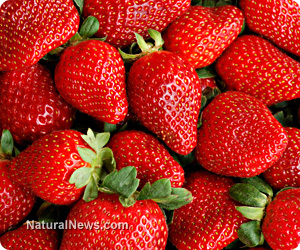 European researchers have uncovered the powerful ability that strawberries have to combat gastritis. "The positive effects of strawberries are not only linked to their antioxidant capacity and high content of phenolic compounds (anthocyans) but also to the fact that they activate the antioxidant defences and enzymes of the body," explains one of the researchers, Sara Tulipani. Their studies showed that ingesting strawberries led to a reduction in the appearance of stomach ulcerations, post-ethanol consumption. Bottom line: The ripe fruit contains substances that can help prevent the start of inflammation at the cellular level. This finding led them to conclude that strawberries are among the most important fruits to fight inflammation and also paved the way for others to look deeper into new stomach inflammatory diseases and related treatment options. The Mayo Clinic advises people with gastritis to eat a diet that consists of low-acid fruits and to avoid spicy, fatty foods. Strawberries make the list of low-acid fruits, as do pears, raspberries and apples. It's also advised to try to minimize stress levels, reduce alcohol consumption and speak with a doctor about switching pain relievers, since they can aggravate the stomach lining. Activities such as yoga or meditation can help with relaxation, and enjoying healthier drinks such as water can help keep stomach problems at bay. Strawberries are good for reducing inflammation of not only the stomach inflammation but other kinds as well, including in the joints. In fact, the Harvard School of Public Health conducted a study which showed that women who ate 16 or more strawberries weekly were less likely to have C-reactive protein (CRP) in the body, a telltale marker of inflammation. Strawberries have also been shown to improve eye health, suppress cancer cell growth and regulate blood pressure. Of course, to help avoid health issues related to pesticide consumption, be sure to choose organic, and hopefully local, strawberries!